I called Mom for advice before attempting these slow cooker baked beans. 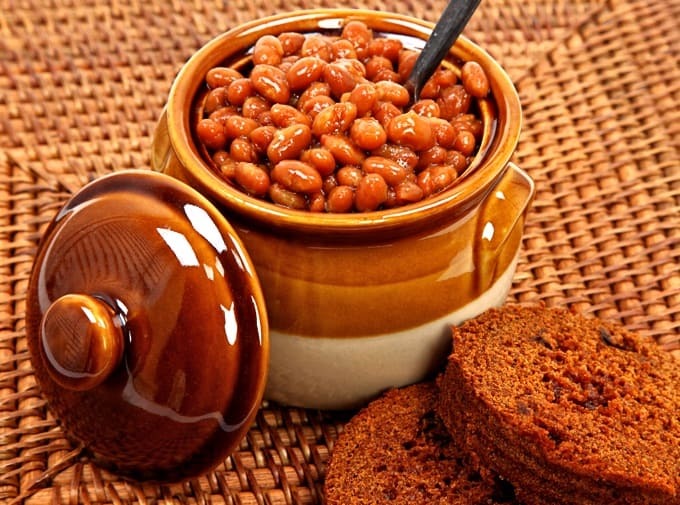 Baked beans and homemade bread were a Saturday supper tradition when she was growing up in Maine. Designed for low and slow cooking, baked beans and the slow cooker seem like a match made in heaven. But she confirmed, what I already knew: Neither my grandmother nor she had ever used a slow cooker to make baked beans. They always cooked them in a traditional ceramic bean pot (affiliate link) in the oven. Then I asked about ingredients. Nana used just salt pork, dry mustard and molasses. Mom liked a little chopped onion added. And definitely no brown sugar or ketchup. After hanging up with her, I opened up How to Cook Everything: 2,000 Simple Recipes for Great Food (affiliate link) for a little more guidance on quick soaking and ingredient amounts. I got a late start with these slow cooker baked beans. They had only been cooking for about six hours when I was ready for bed and they were still hours from done. I spent several minutes contemplating the alternatives, then flipped the crockpot to warm and let them cook all night. 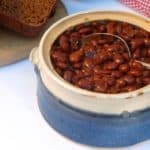 I woke up to discover perfectly tender slow cooker baked beans in an incredibly rich dark brown sauce, just like Mom used to make in her bean pot! We enjoyed these slow cooker baked beans for supper with cole slaw, chicken apple sausages and still warm slow cooker whole wheat bread. And then I had them again on toast for breakfast. Rod and I thought they were perfect, but they were a little heavy on the molasses for Mom. According to my calculations each serving has 175 calories and *4 Weight Watchers PointsPlus and *5 Weight Watchers SmartPoints. Now that beans are Zero SmartPoints on WW Freestyle, these slow cooker baked beans have dropped to just *2 SmartPoints per serving. Enjoy! 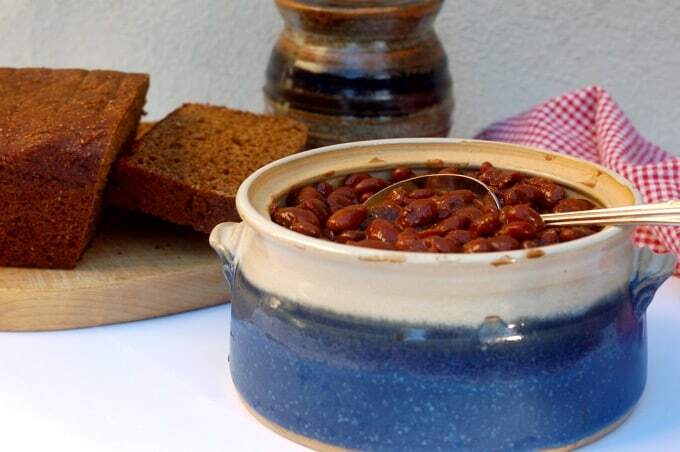 If you’ve made these Slow Cooked Baked Beans, please give the recipe a star rating below and leave a comment letting me know how you liked them. New England Style Slow Cooker Baked Beans, cook up hearty, satisfying and delicious. 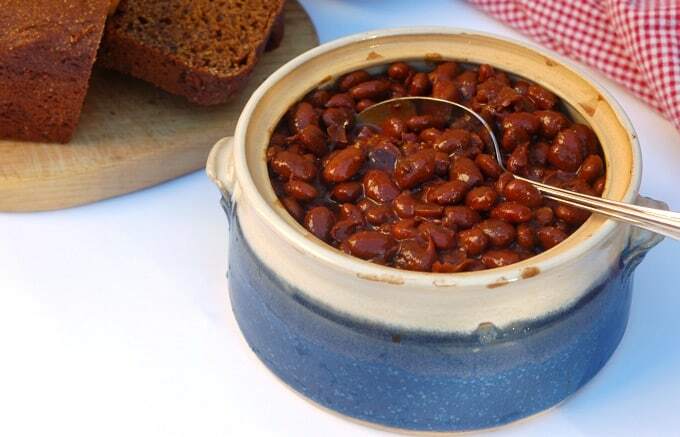 Place the beans in a large bowl and cover with water by an inch or two and let soak overnight. Alternatively as a quick soak method, place the beans in a large saucepan. Cover with water by 2 to 3 inches. Bring to a boil and let boil for about 2 minutes. Then turn off the heat, cover and let stand for 1 - 2 hours. Place the pieces of salt pork in the bottom of the crock pot. Drain the beans and add to the crock pot. Mix together the molasses and mustard and stir into the beans. Cover with boiling until it is above the bean level by 1 inch. Cover and cook on LOW for 10 to 12 hours, until the beans are very tender. After about 6 hours, taste and adjust the seasonings, adding salt, pepper, molasses and/or mustard to taste. Source: How to Cook Everything: 2,000 Simple Recipes for Great Food (affiliate link) by Mark Bittman. Cover with boiling water by 1 inch. Does it mean to leave an inch of water above the beans? Do you know what the SmartPoints equate to? Hi Lois, The only thing I can think of is that my recipe is lower in sugar since sugar really causes the points to spike on the new WW freestyle program! Hope this helps.